Why a 22LR ammo shortage? After a year or so, I just purchased 300 rounds of 22 Long Rifle (lr). Anyone who knows anything about firearms knows that there has been a massive shortage of rifle and pistol ammo, especially the 22lr, for over two years now. You will be hard-pressed to find 22lr’s at places where you should otherwise find them quite easily, namely Walmart and Dicks sporting goods. What is causing the shortage? And why hasn’t the price gone up? Hopefully my Economics background will provide insight into why I can’t plink around anymore. I hope to provide some insight into why this is the state of affairs and will provide the ONLY solution to this problem. First, let me debunk one theory. Some believe that the government has purchased millions of rounds of ammo, particularly hollow-point, for the expressed purpose of ridding ammo off the shelves for the average person. While DHS really did purchase thousands of rounds of ammo, this would be a stupid way to limit ammo usage by the average gun-owner. Buying up ammo would only send up the price (as we will see), but it would not make it impossible to purchase. People would still be able to buy them, just at a higher price. If anything, if the government tried this tactic for years to come, new companies would enter the market to off-set the demand. Second, forget DHS, Bush’s stupid wars alone would be sufficient to send the demand up, but we did not see this happen until after the gun control debates. Last but not least, DHS’s acquisition of the rounds takes place over 10 years, not 6 months. So given the crazy demand, why don’t ammo makers produce 22lr non-stop, 24/7, until demand is met? After all, won’t they make a profit? In short, unless they are that streamlined, its bad for business. Companies eventually hit what Economists call the “law of eventually diminishing marginal returns”. This means that at first a surge in production will mean they will turn a higher profit, then a reducing profit, then the profit will fall to zero, and eventually the cost of producing ammo will exceed the market price of ammo. This is represented graphically below. Marginal Product is the benefit that a company gets per each additional unit of production of, in this case, ammo. At first the company’s profits go up very quickly, but after a while they slow down, flat-line, and start to fall. No company would produce past the point where they lose money per unit they produce. Given that there is no tangible reason for a run on ammo, I believe the demand-craze is entirely based on the self-fulling prophecy of an ammo shortage. Many were concerned that after the wave of mass-shootings, the Obama regime would implement a ban on guns and ammo. So people went out and bought ammo today, fearing it would not be available tomorrow. When the second guy went to the market, he saw that ammo was no longer available, triggering a fear that rippled to every other buyer. After a while, if you found it on the shelf, you bought it even if you did not need it. Lets be honest, this fear is not only irrational, its stupid. We had one of the worst mass shootings in the history of mass shootings, resulting in dead children – but even then Congress was unable or unwilling to even marginally regulate guns. If that will not result in even basic changes to our gun laws, nothing will. So fears of the government coming to take our guns and ammo are unfounded and nearly impossible. There are two minor but aggravating factors with regards to the 22lr that does not affect other calibers. First, 22lr is rim-fire so shooters can only use their brass one time. This means the demand is not mitigated by ammo re-loaders. Second, 22lr was/is a very cheap round to fire – it is commonly seen as a beginners round. This means a lot of casual shooters, who make up a significant portion of the shooting community, prefer to fire 22lr. WHY hasn’t the price gone up? Its economic law that if the demand goes up but the quantity supplied (fancy term for supply) does not go up, the price should increase. But how come when we go to Walmart, its still see a low price? Well first off, the price has gone up in primarily one of two ways. The price went up on secondary markets, particularly online. A quick search (10/6/2014) shows me that the price for 100 22lrs is about $18.04, compared to the in-store price of less than $10. If you buy in bulk you’ll get a much cheaper rate, but then factor in the shipping costs. But there is another kind of price the consumer is facing, the price of unavailability. Consumers can’t find it, so they are forced to invest more time in searching and searching, arriving at the store at 6am, etc. This is a non-monetary cost. First, Walmart has locked-in rates per good with their distributors. This means that if the price of the dramatically increases, they can still purchase ammo at a cheap price. However, because of their Just-in-Time business model, they have no fixed quantities of guaranteed delivery. Therefore, CCI or Winchester are not required to deliver “X” number of ammo, and might be less inclined to sell to Walmart, but sell to other buyers where they can make more money. So why doesn’t Walmart just jack up the prices? That’s the million dollar question to me. Without any evidence, my pure speculation is that its a means to get customers in the door, after which they will buy something else. A lot of people curse the “price gaugers” those who buy cheap, but sell for double the price. I entirely disagree, I hope people continue to raise the price. Before I get into the graphs, the raising the price will mean that the hoarder will think twice before purchasing yet another box of 22lr to rot in his basement. A higher price means he might pass on the next purchase. As that happens, ammo will gradually return to the shelves and people will be able to buy. When people see ammo, albeit at a higher price, it will cool down the craze, eventually resulting in cheaper prices. The following graph illustrates the way things are, and the way things should be. Now to get technical: The Red line describes the quantity of ammo companies will supply. In English, as the price goes up, ammo companies will produce more ammo to make more profit. Conversely, the Blue line describes the quantity of ammo people will buy. As the price goes up, people buy less. As it goes lower, people buy more. 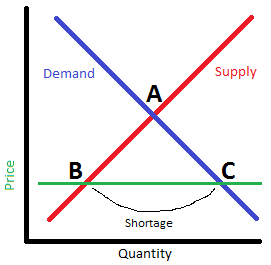 In a perfect economy, we would be at point A, where supply and demand would equal each other. Point A is called the “Fair Market Price”. Instead, we are at point B, where companies are uninterested in producing as much as they would at point A. But conversely, consumers demand at point C! So, the distance between the quantity that business produce, B, and the consumers demand, C is the shortage. Therefore, a higher price means the end of the shortage. So my conclusion: RAISE THE PRICE OF AMMO! People and companies should price-gauge, and continue to do so until they cannot make another dollar of profit. It is not immoral, it is a means to fix the market and get ammo back on the shelves. End Structured Rant. Your thoughts? Israel is an Apartheid State, this much is known. Their recent aerial bombardment of Gaza has renewed my interest to oppose their state terrorism. But no matter what, the US will support Israel. So, what can be done? Solution: Target Apartheid Israel’s Economy! As a student of Economics, I know that countries are most affected by shocks to their Economy, Israel is no exception. We must divest and boycott companies that have significant investments or financial interests in Apartheid Israel. Additionally, we should notify companies why we refuse to buy their goods and services. Email all companies that I invest in asking whether to what extent they have investments in Apartheid Israel, and demanding that they divest or that I will sell my stock. Downloading the Buycott app on my smartphone and scanning all products that I purchase to ensure that they are not targets of the Boycott. If they are, I will not buy them, and email or call the company to declare why I am not purchasing their product. Spreading the word and encouraging others to divest from Apartheid Israel. I hold a significant personal investment in [COMPANY NAME]. However, due to ongoing events in the Gaza Strip, I am re-evaluating my portfolio to divest from firms with sizable investments or financial interests in Apartheid Israel. Please tell me to what extent [COMPANY NAME] has economic interests in Apartheid Israel. If possible, please also provide me with investor literature related to [COMPANY NAME’s] commitment to human rights. It worked for South Africa and it will certainly work against Apartheid Israel. Join in! This is not my idea, nor is it a particularly new idea. Unfortunately, as with most of my uniquely constructed ideas, I was not the first one to come up with this either. I mention it here only because its worth thinking about, especially as American has become hyper-nationalistic in the last decade. All empires eventually grow old and eventually die. They can die violently through a war, or slowly through economic and political decay. You can see this with the great Chinese Dynasties, or the Roman Empire, or the Ottoman Turks, or the Mongol Conquests. Even in our modern times, we have witnessed the collapse of the Soviet Union. That leads to an interesting question: Will the American Empire someday collapse? I don’t mean America’s colonies world-wide, I mean the the continental US. I believe so. I don’t know when, and though it might be an interesting time to live through, I hope it happens well after my death. But like every other Empire, the American Empire, this great continental land mass from Coast to Coast, will eventually break up, have inter-state wars, and slowly come to an end. In my opinion, it will happen primarily as a war between the federal government and state governments. While there will be “rally around the flag” elements of American-style protestant Christianity, urbanisme vs ruralism, racism and its retarded cousin nativism, its real root cause will be the crippling effects of the national debt on the economy. In short, the federal government will overspend, which will result in excessively high interest rates, a devaluation of the dollar, and possibly inflation. The federal government will install new restrictions and regulations on economic and human behavior in a vain attempt to curb the crisis. This will be interpreted as yet another federal overstep of power. It will initially be met with anger, then protests, then armed resistance of attempts to implement them from locals, then organized militias and finally the state militia, National Guard units, which answer to the governor not the president. The New England states, Northern and Urban states will keep DC and will symbolically be the capital of the US, as the Rome was the capital of the Roman empire. The Southern, Rural and Midwestern states will be disunited. Okay, enough rant above. The point is, the US like all former empires will eventually grow old and die. So why have this semi religious-like love of the US? I don’t get it. Curently, you have two methods of financing your college tuition. Take a student loan. Problem – the Qur’an (and Torah) say that usury/ribba is haraam. So…if you don’t have a sugga daddy, how do you manage? How does a poor Muslim seek financial assistance in his education? I thought of a method to finance student tuitions without incurring ribba. Ready? Here’s how it works: Lets say you want a degree in Economics (my major). You find an investor who pays for your education, lets say $40k over 4 years. The investor then owns “stock” in your education and is entitled to dividends from your education. Once you graduate and get a job in your field, the investor gets 5% (or whatever rate agreed upon) of your income per year he owns the stocks. As the student-now-worker, you can buy back the shares of your tuition at an agreed upon price between you and the investor. Obviously the investor will want to recoop his investment of $40k + inflation, either through the 5% dividends or re-purchase of the stock. So its up to you two to decide on prices, dates, et al. You get your degree, investor gets a return on investment. Win/Win! Not haraam…hopefully, I have to get it verified with a legit ‘Alim. 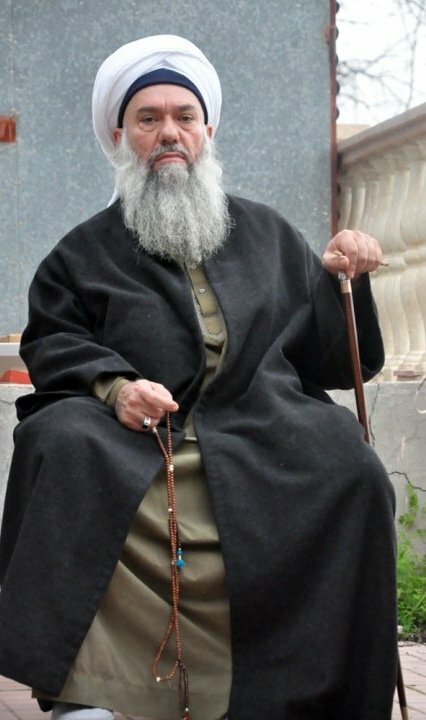 Anyone got Mufti Taqi Usmani’s cell? Guarantees legit degrees – You don’t major in, ahem, useless majors. Honestly, there are some majors that have little utility. If you’re getting an education for fun or social value, find your own means. But if its to make money, some majors simply have less value than others. The student does not have to pay a debt, irrespective of his future income. Investor has an incentive to help the student find the highest paying job, helping with resumes, asking his contacts, networking, etc. Currently, the gov’t will give you a student loan even if your grades are F, F, D, and C (Zach Morris’s grades). So, a lot of people who, frankly, just aren’t cut out for higher education can rack up debt with no way to pay it off. The downside: There are fields of study that are essential to set the “direction of society”, provide social commentary, and offer a scholarly voice on current issues. These require degrees in things like History and Sociology. Yes, these are essential for any community, but often result in low yielding incomes. This kind of degree would demand a different way of funding, maybe from a Waqf. Secondly, some people would not qualify for financing…but, this is not necessarily a bad thing. The vast majority of the Internet currently operates on Internet Protocol Version 4 (IPv4), a 32-bit addressing system which theoretically allows for 4,294,967,295 (2^128-1) unique IP addresses. Though this may seem like an inexhaustible supply of addresses, current figures estimate less than 10% of it remains. The remaining address space would be far less had it not been for the deployment of Network Address Translation (NAT), which extends IPv4’s life, but also breaks the End-to-End principle. So…what happens when the address space completely runs out? There is slow and gradual transitional to Internet Protocol Version 6 (IPv6), a 128-bit addressing system which theoretically allows for 2128-1 unique addresses. Wow, that’s a lot of address space. (FYI, much of the address space is wasted) But, that transitional period takes time and money. And if businesses demand an internet routable address before IPv6 has been implemented by its ISP, what happens? When IPv4 becomes completely exhausted, there will be essentially two models of how the Regional Internet Registrys (RIRs) and Tier-1 ISPs could opt to distribute IPv4 addresses once they are “returned”. In the first model, RIRs and Tier-1 ISPs could distribute address space based on a first-come first-serve basis. In this system, Tier-2 and 3 ISPs would have to wait in line to receive address space. This could take decades, essentially eliminating any business that immediately requires dedicated IP space. In the second model, RIRs could distribute address space based on the price-system. That is, when a block becomes available, it would be auctioned off to the highest bidder. In my opinion, the pricing distribution system is more efficient than the waiting-line system. This is because it ensures the most economically efficient utilization of address space. Only those entities that can produce the highest rate of return with the investment of their IPv4 address space be willing and able to purchase it. In short, this follows the basic economic laws of higher prices when demand increases but supply cannot increase. As the price of IPv4 address space gradually increases for businesses, organizations and home consumers, they will gradually transition into the IPv6 internet. I predict mass utilization of transitional solutions, which are not long term, but function just as fine. Initial investments for native IPv6 implementation will be costly, but the marginal cost will reduce for each additional implementor. I’m starting this blog as a medium to express my ideas, gain the insight others can provide, and as a sort of personal diary to trace the development and evolution of my thoughts. My main topics of interest are economics, theology, computer science, social commentary and any other idea that comes to mind. Economics: I currently hold a B.S. degree in Economics, with a focus on Macro-Economics. I am currently perusing an MBA. Theology: Coming from a Muslim background, I’ve taken countless courses in the faith and continue to read its classical literature. I’ve looked at Jewish and Christian theology and take an active interest in the New Atheist movement. Sadly, I do not know much about Hindu or Buddhist tradition, but I hope to continue to explore and gain insight. Computer Science: I am currently employed in IT security and am well-versed in most major areas of Computer Science, including programming, networking, security and operating systems. Social Commentary: My family stems from the Indian Subcontinent and Central Asia but I was born and raised in the US. This has afforded me an insight into Eastern tradition, particularly in the Muslim world, and Western modernity. I am connected to both the socially liberal and socially conservative movements in the US. One of the most cretinous yet pervasive qualities is the inability to listen to the views of those who directly disagree with you and be unable or unwilling to at least respect its development, logic and authenticity. Part of life is experience. I am open to trying out new ideas and concepts and seeing where they take me in my development as a human being. I hope you enjoy reading this blog. Please do comment!